At first, my phone call was harbored with deep suspicion. Why, the interest? She didn’t have time right now. She had nothing to say, even as she told me she had two boxes from Silvia’s house. More phone calls and emails resulted in messages never returned. An attempt by a mutual friend to arrange a meeting was hopeful until later the meeting was canceled. I tried again and then again and again. Patience has never been my strong suit, although toward this purpose I held a determined certainty for nearly a year. That is until last month when I learned that the housekeeper holding the boxes was moving out-of-state. I panicked in that quiet, desperate way of not quite knowing what course of action to take. It was the panic that catches you in the off hours while getting dressed in the morning or cleaning the kitchen after an evening meal. What would become of the boxes? Lost in a move? Thrown to a moldering landfill? Or the more typical fate of papers in Vermont, consumed in a backyard fire? I didn’t know the content of the boxes, but I knew everything I could find was significant. My final attempt was impulsive. I was cross-checking a reference for another piece I am working on when the housekeeper’s phone number came across my desk once again. There was that single moment of inhaled pause as I weighed the risks. Would I make the situation worse and lose the boxes altogether? Should I wait for the mutual friend? But I had once before waited too long to meet Silvia and came to regret it. The housekeeper answered the phone. She had been driving around with the boxes in her car. Where could she leave them? When could I get them? With patience in its final hour, I answered, now! Only on my return trip, two boxes safely anchored in the backseat, did I notice the startling beauty of the autumn landscape. Bands of silvery mist were drifting across the crimson and gold of the mountainside like an extended exhale from the gods. Hand selected by Silvia, the papers she considered most significant to her life and literary history I unpacked along the length of the kitchen table. Here in black and white were the photos of Silvia in the Harlem flat. The captured snapshots of precious smiles, the “girl dancing with the joy of being alive.” Slipping further back in time, I find a snapshot of Silvia and Henrik Visnapuu at Viinamärdi, sitting on the limestone wall in the garden behind the house, instantly recognizable as the place my own feet had walked but four months past. I unfold her naturalization papers, the letters from family and friends and open a journal kept late in her life at the turn of a new millennium. On my kitchen table were the images and documents that closed the gap in my search to find Silvia. The second box is filled with books and manuscripts. These must be the books carried out of Estonia by Visnapuu when he fled the Soviets. Inserted in the pages are publisher’s cover proofs, an original drawing. Beneath the books are yellowing musty manuscripts composed in a displaced person’s (D.P.) camp after WWII, scraps of poems in his hand, with a pencil or a fountain pen, the words crossed out and replaced – a process of language and imagery and meaning. I find an Estonian fairy tale in English, which I read with delight. 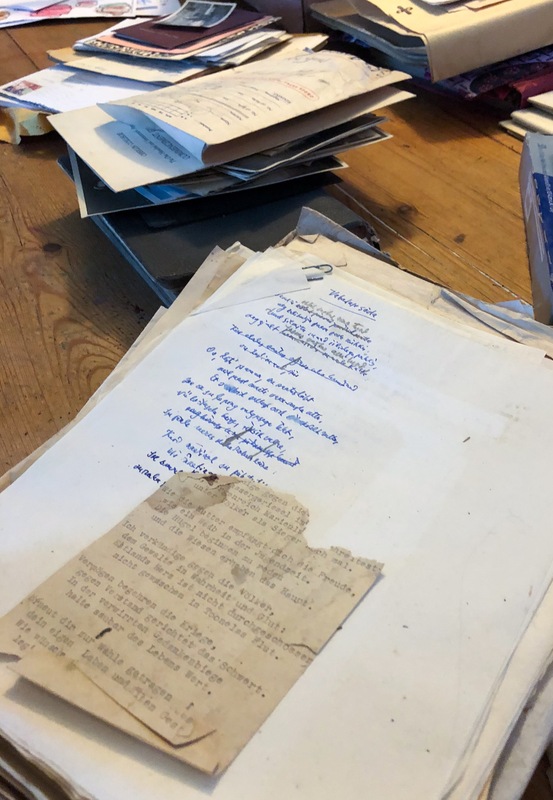 Yet most meaningful to me and perhaps to Silvia, the manuscript of Visnapuu’s memoir, Päike ja Jõgi is at the bottom of the box, the pages Silvia typed in the Harlem flat and the words of the book I bought in Tallinn with flowers pressed between the pages. Today I sit at my desk with the play of shadow and light on Silvia’s photographs and papers. I am reminded of the day I first opened Silvia’s cookie tin, the Pandora’s box of a most unusual journey. Since then, in following Silvia’s life, with its many variables of chance and unexpected outcomes, I have been consistently reminded that the course of life is wholly unpredictable. Time and place propel us toward the unanticipated, even as we anticipate. If we are tenaciously determined, we may consider ourselves lucky. Even then, many are not. It is really up to each of us to find meaning and purpose where we can. To love, even when it brings sorrow. We cannot part with it much before. Thank you, Silvia. Postscript: Although speculative, I believe the housekeeper took the boxes at Silvia’s request and intended to send them to Piret Noorhani at Tartu College in Toronto. Her reticence to give them to me may be in part to honor her word to Silvia. The boxes will be sent as Silvia requested. Sheaves of poems on the kitchen table. Thrilled they are finally in your possession! Such a beautiful experience and amazing story to be a major part of being told!